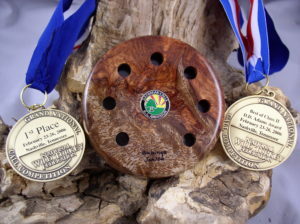 Daybreak Turkey Calls are hand crafted by founder and call maker, Gary L. Anderson. Since 2006 when the first Daybreak Call ever entered in competition won Best in Class and the D. D. Adams Award, Daybreaks have been perennial winners in every major custom call making competition in the United States as evidenced in the honors listed on our Awards page. The judges in these competitions evaluate two qualities, 1) authentic turkey sound, and 2) ease of use. Daybreak Calls possess the additional distinction of unsurpassed fit and finish. This accounts for their consistently winning in the Decorative Division of the NWTF Grand National Call Making Competition. All calls come with an unconditional satisfaction guarantee. The client must be totally satisfied. Nothing less is acceptable! 2006 D. D. Adams Award winner, the first Daybreak Call ever entered in competition. Soon there will be on the Calls Available for Purchase page pictures and descriptions of Daybreak Calls which have been competition winners and consistent performers in the field. A judge’s opinion of a call is of little consequence if turkeys aren’t impressed. This site will eventually include accounts of monarch toms convinced by Daybreak Calls to make fatal errors in judgment. The site will also soon contain complete instructions on placing an order. For now, simply click on the Contact page and send a message directly to Gary. He will be back in touch quickly with guidance in selecting and ordering calls. We are honored by your interest in Daybreak Turkey Calls and will assist you in a timely and courteous manner. Customer service is one more distinction of Daybreak Calls. Check out the Call Maker Profile page to learn about the development of Daybreak Turkey Calls and what the last eight years have meant for Gary and for Daybreaks. Enjoy the site! Gary L. Anderson…making calls today like others will tomorrow.